Making it to graduation is a major accomplishment. Getting an education is not only about learning content and attending classes. Hopefully along the way you have learned transferable skills and valuable lessons. Remember that life isn’t always going to be easy. There will be rough days and seasons. Making it to graduation means that you how to endure when things get tough. You will be encounter adversity in life. This accomplishment can be a landmark things get tough. Also remember there are rewards for sticking it out. Jackie Robinson was the first African American Player to play in the MLB. He faced many obstacles but he endured. He maybe one of the greatest players. Not only was he elected to the Hall of fame but he is the only player to have his number retired by the entire league. 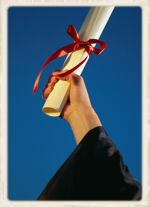 Getting a degree widens you job prospects. I once had an employer tell me he only hired people with degrees. That proved the individual has the ability to stick with a task. As a computer teacher I spent a lot of time teaching students to think and solve problems not just software. Hopefully you have learned how to dream. Do you take life as it comes or do you take charge? Need more than just a big idea but you also need a practical plan. What steps are you going to take to accomplish your dream. Even when life takes you on detours always have a dream. So you have you graduated, now what? A diploma can open doors or it can just be wall art. Graduation from an elite school doesn’t ensure success. After graduation it is what you do with the knowledge that counts.